Café Pauli is combined with Dramaten terrassen. Café Pauli can seat 64 people and Dramaten terrassen 100 people. They are located on the first floor above the entrance of the theatre with a stunning view over Nybroviken and Strandvägen. Summertime you can watch the royal guard parade on horses pass by. 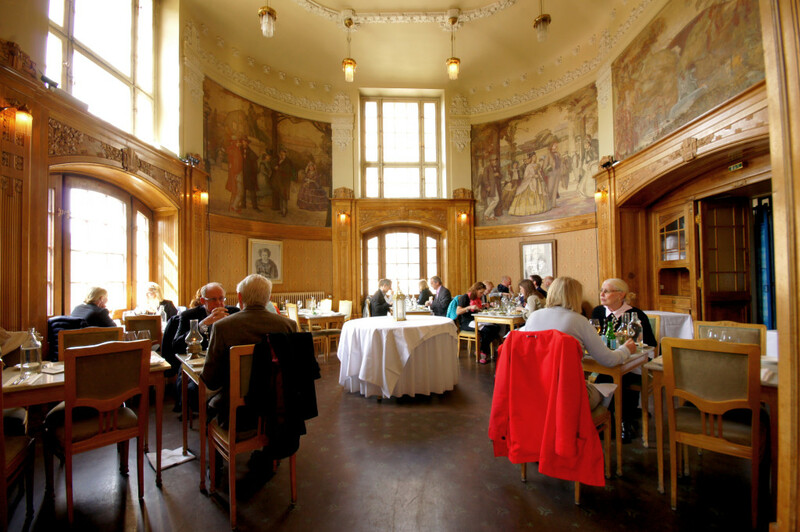 Café Pauli is named after the famous artist Georg Pauli who has made the fantastic wall paintings in the room. Here we serve lunch Monday-Friday. Please see our menu. On the terrass you can eat all day long until late at night during the summer. If you would like to host an event you can book Café Pauli or Dramaten terrassen. For groups and companies we offer different solutions. For example we can arrange guided tours and rhetoric lectures with actors together with different kinds of meals, snacks or drinks.